Senior Grant Hughes finishes running a lap around the field. Recruits like Grant complete rigorous training to be eligible to serve. Step after step, shoes pound on the hard ground, as the thirty-something young recruits run another lap around the field. The wind blows strong around the group, tousling hair and twisting the imprint of the word “Marines” on their shirts, but their eyes are bright and eager. As the sun sets behind them, the sky fades from orange to pink to violet. A bellowing shout comes from the sergeant as he urges the recruits to push themselves harder. Throughout the exercises, recruits count off numbers in unison, speaking in one voice. 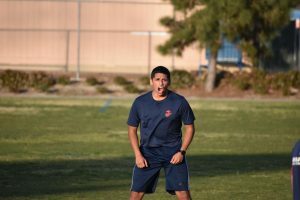 In between sets of intense workouts, they take laps around the grassy field, running as fast as they can to make it under the time the sergeant calls out or risk the punishment of having to restart the session from the beginning. As the physical training session draws out, one recruit throws up in exhaustion and another steps out of the circle on the verge of collapsing. Most seniors are spending the end of the winter awaiting college admission decisions, hoping to find out what their futures may hold for them, but these young people already know what lies ahead. They come together every Monday and Thursday to push themselves to their limits because of the future they have chosen — a future in the military. This choice can lead a person in many different directions, so the reasons behind a person’s decision to swear in varies. Some come from military families and are eager to carry on the tradition, some are searching for a way to get through college without student loans, and some are just on the hunt for a challenge, a change in pace of life. Whatever the reasoning behind it, this decision is a big one to make and it is important to be well prepared. Senior Makennah Layng had been thinking about the military since her freshman year, but had not had much information on it before. As she learned more and more, her interest blossomed. She began to see it as a way to secure her future while doing some good with her life. Layng has had some relatives that served in the military, but this did not have a strong influence on her decision to join. 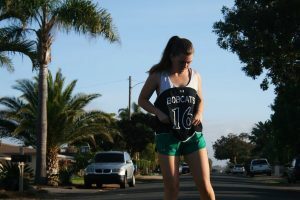 Her eagerness comes more from a desire to see new places and learn new skills after the humdrum, mundane routine of high school. “I think coming out of high school [and joining the military] will widen my horizons and allow me to travel a little bit and see the world while doing something that’s pretty cool and learning a skill and a trade in a different setting,” shared Layng, with an excited air about her. The military’s five main branches are the Army, the Marine Corps, the Navy, the Air Force and the Coast Guard. Layng is currently on the path to join the Marine Corps and has been training for some time. But her path has not been straightforward — she did not always know what she wanted to do. Layng noted that any branch would have given her the security she was looking for, but the Marine Corps provided her with a challenge. “All of [the branches] would’ve given me the same financial stability and benefits I was looking for, but the Marine Corps was the one that allowed me to be physically fit and challenged me the most,” Layng said. People join the military for a wide array of different reasons ranging from their personal interests to their future goals to their family history. Layng signed up in hopes of the military providing a stable and secure future for her, but in her research she found she has an interest in the intelligence sector of the military. Layng is striving for a secure future so she can explore her options regarding what she wants to do after serving her time in the military because like the majority of teenagers, she does not have a clear plan of what she wants to do with her life. “When I’m in my mid-twenties, or late-twenties, I [want to] have an idea of how I’m saving, or what I’m going to do, to set myself up for the future if I want to do something because right now I don’t know what I want to do … I’m still trying to figure it out and I want to do it the best way and save,” Layng said. Students joining the military may not have to take the SAT or ACT, but that doesn’t mean they get to avoid testing completely. Currently, Layng is studying to get a better score on the Armed Services Vocational Aptitude Battery (ASVAB), a test designed to determine if an applicant is ready to join the military, and what sort of jobs they may accel at. 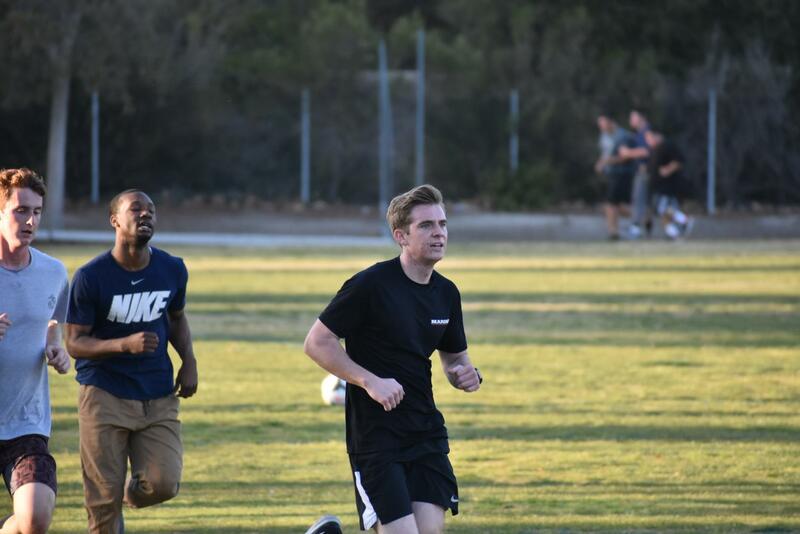 Aside from the ASVAB, recruits need to prepare physically for the endeavors ahead. With a grimace on her face, Layng alluded to the fact that the physical training is no easy feat. But the grimace turned to a smile as she reminded herself of the satisfaction that comes from achieving such a difficult goal and she gave words of courage to students struggling through the process. The marine recruits gather together around the sergeant after their workout is over. For students who want to learn more about what the military has to offer, Layng provided information on contacting a recruiter. While Layng’s military goals line up with her future aspirations of financial success, senior Grant Hughes hopes to fulfill dreams of the past in his military career. He had not always known that he would live his childhood dreams of flying planes through the military, but now that he has decided to join the marines, he loves the path he fell into. Hughes is the first of his family to enlist and, like Layng, he has chosen to go into the Marine Corps. This decision came as a result of the research he did on the Air Force. What he found did not resonate with him like the Marine Corps did, and his path changed once more. He will start out in reserves, helping pilots prepare for flight, but after a couple years, his childhood dream of flying will become a reality. Hughes affirmed Layng’s description of the difficulty of the physical training sessions (PT), but this has not discouraged him. Instead, he looks forward to the hard work ahead. Senior Grant Hughes does push-ups with his fellow recruits. In a plaza off of El Camino Real, two offices stand as uniformly as the men inside. Side-by-side, but not the same, each offers a different future for whoever walks inside. The Marine Corps recruitment center is on one side and the U.S. Army recruitment center is on the other. Seemingly plain on the outside, the insides of these buildings are bursting with energy, as officers clad in uniform talk to one another, ready to help those looking for information. In the Army recruitment center is Staff Sergeant Casusus, an officer who all the answers for the curious recruit. Hughes and Layng both followed paths that were full of twists and turns. They explored different branches and learned all they could before settling on the one for them. Talking to a recruiter is one of the most efficient ways to find out more about the military and the branch that fits you best. Staff Sergeant Casusus, an army recruiter, agreed with this and also advised interested students to explore before they settle on a single branch. Recruiters are also equipped to answer all the questions a recruit may have. Casusus believes asking questions is an important part of the process of finding where you belong. Layng and Hughes each had a unique reason for enlisting — a reason that lined up with their own future goals in life. But not everyone has a clear vision for their future. Staff Sergeant Casusus ended up enlisting because he did not know what he wanted to do and the military helped him find a career. “[The military provides] college benefits, career opportunities and [the possibility of] maturing as an individual,” Casusus finished. The intense level of difficulty that comes with training for the military is something that may deter some people from joining. “Training is difficult, for all branches, it’s going to be challenging,” Casusus articulated honestly. Casusus encouraged those who are feeling the nerves, reminding them of the pride that is felt after doing something that seems impossible. “You are going to have to reach deep inside yourself to push yourself harder than you probably ever thought you could push yourself, but once it’s all completed you usually come out with your head a little higher because you’ve done something that only one percent of the nation does,” Casusus stated with an earnest look on his face revealing how much he believes in the words he shared. Many students may be on the fence about joining up the ranks. This is a big decision to make, so it is important for students to know what they are getting into and if it is right for them. For students who are hesitant, Casusus gave the advice of looking deep inside of you and discovering what is pulling you in toward the military and what is pushing you away. A recruit counts off as he goes through the work out. Casusus’s guidance encourages interested students to jump right into the unchartered territory if they think it is something they really want to do. “You just have to jump in and keep moving forward because the moment you start doubting yourself is the moment you’re already setting yourself up for failure,” Casusus assured. Casusus’s outlook on pushing past the nerves is one that is pretty common in the military. At the end of the Marine Corp’s strenuous physical training sessions, the group gathers together as the sergeant yells “Bring it in!” The recruits are tired, but not without smiles as they know their hard work will pay off in bootcamp. The sergeant looks at them with pride and shares some words of encouragement before he dismisses them to go back to their lives as regular teenagers. They all come from different backgrounds, schools and communities, but they have one thing in common: a desire to serve their country. Thank you for writing this piece on the military and the opportunities it has for young men and women that are possibly considering this career. It is not for everyone, you described the training well, the dedication and drive of those that enlist are driven to work hard and serve our country. Thanks for sharing their experience.